Have you ever watched that TV show Shark Tank? The one where budding entrepreneurs pitch their business ideas to multi-millionaire investors. Knowing how to communicate effectively with potential business partners is crucial to your success as an online entrepreneur. And the most important business partners you have in eCommerce are your suppliers. Approaching suppliers can be daunting. No one wants to come across as a nervous newbie. Your lack of confidence can send suppliers running. Your naivety can result in you being ripped off. But approaching suppliers doesn’t have to be difficult. By approaching suppliers like an eCommerce pro, you can close more business deals, establish long-term relationships, and make more money. It all comes down to effective communication. If you’re at the stage of wanting to approach suppliers, you’ve probably already identified a few that you want to contact. However, if you’re not sure about the suppliers you’ve found online, or you’d like to have a few more options (we recommend contacting at least five), here are a few quick tips. 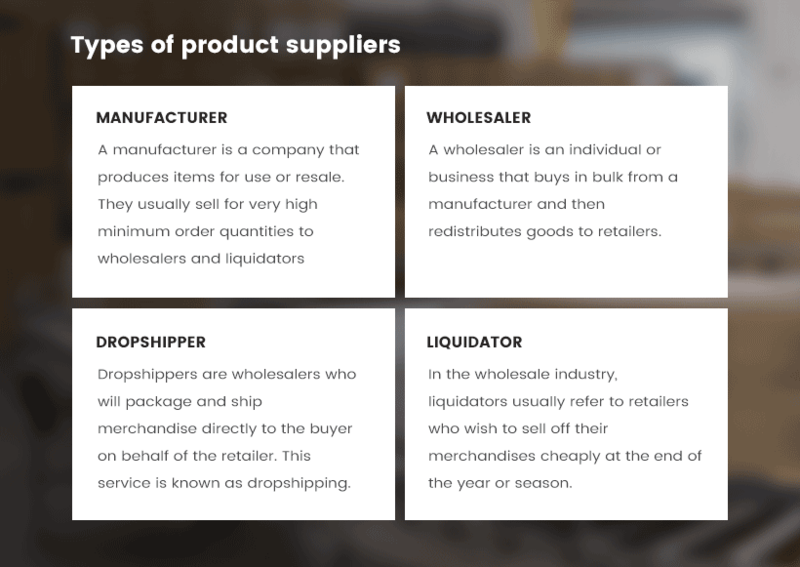 What type of supplier do you want? It’s important to know which type of supplier you’re looking for before making contact in order to avoid wasting your precious time (and theirs). A simple Google search for suppliers in your niche is a good place to start. You can find an in-depth guide to sourcing reliable suppliers here. In order to communicate effectively with suppliers, you must think like a supplier. Put yourself in their shoes. What would you be looking for in a customer? It’s important to know the suppliers want new business. They just want to be sure they’re dealing with someone they can trust. Usually you will be approaching suppliers via email to begin with, so think about the words and tone you use. You should also project the FIVE qualities that suppliers are looking for in a new customer. You need to come across as a serious businessperson. Popular suppliers get emails from people who are “just browsing” or still thinking about starting an eCommerce business all the time. Suppliers want to know that you’re professional and you have genuine intent to buy from them. You need to talk like an entrepreneur, have a business that’s ready to go, and be committed to following through on your plans. Even if you’re not 100% sure about your business idea, you need to project a degree of certainty if you want suppliers to take you seriously. Get to the point quickly. While you might want to tell everyone about your eCommerce business like it’s your new baby, not everyone wants to hear about every little detail. Be clear and direct with suppliers, know what you want and keep it simple. While you need to be direct, suppliers also appreciate good manners. You can be to the point while being friendly. Say hello, use their name if you know it, don’t make unreasonable demands, say thank you. I know you might think successful entrepreneurs play hardball to close business deals, but it’s good to remember the old adage: Treat people how you’d like to be treated. Suppliers are ideally looking for someone that they can work with long-term as this provides them with more predictable income. If you’re new to eCommerce and you haven’t launched your online store yet, you don’t have to let suppliers know that. Act like a pro. Communicate your commitment to your business and the product/s your looking to source. Project an air of confidence. If you’re an experienced online seller, let suppliers know how long you’ve been in business for, provide a link to your store, and promote your successes. Suppliers are more inclined to work with people who have a track record. Suppliers want to know that you’re legit. They want to know that you will pay on time and that the business relationship is mutually beneficial. If you get awkward when negotiating prices or complain about paying for goods upfront, you’re going to spook suppliers. By understanding how supplier-customer relationships work and having a viable business plan, you should be able to talk about money with confidence from the outset. Tip: If you’re new to eCommerce, you can reduce a supplier’s exposure to risk by offering to pay upfront. Now that we’ve covered what suppliers are looking for, here are the FIVE things that will be a dead giveaway that you’re an eCommerce newbie. Also known as the five things that will make suppliers run a mile. Email can hide a lot, but it won’t hide a lack of confidence. The best way to come across as confident is to learn as much about eCommerce and dealing with suppliers as possible before you make contact. Knowledge is power and power fuels confidence. A lack of confidence can lead to asking vague questions. This is also known as a “fishing expedition”. The supplier is not there to hold your hand through the process. Asking vague questions tells the supplier that you haven’t done this before. This is a sign that you’re contacting suppliers too soon. You should know your niche, have a handful of good product ideas, and a viable business plan before you start dealing with suppliers. Are you looking for a wholesaler, a dropshipper, or a private label manufacturer? If you don’t know exactly what you want from a supplier, you’re wasting their time and yours. You balk at prices. You question shipping costs. You refuse to pay upfront. These are all warning signs to suppliers that you’re a newbie. It’s important to care about money, but you must also realise that business deals need to work both ways. If you make things too difficult for suppliers, they won’t want to work with you. If you email a supplier asking to buy 20 units when their website states that the MOQ (minimum order quantity) is 500 units, then you’re letting the supplier know you haven’t done your research. If you email a dropshipper in China and demand 24-hour delivery to your customers in the United States, you haven’t done your research. Doing research upfront to build up a strong foundational knowledge of eCommerce will help you to have confidence, ask clear questions, know what you want, and be realistic about money. The moment you decide to start an online business, you’re a businessperson. You’re an entrepreneur. You’re a boss. Got it? Now it’s time to start acting like one. You need to exude the confidence of an experienced businessman or woman, even if you’re not. Refer to yourself as the operations manager or director. When you’re a newbie, you do have to “fake it till you make it” a little bit. Use eCommerce lingo. Speak the language of suppliers. Know how long it usually takes to ship products from China. Read blogs by eCommerce experts. Understand how to order samples. Learn the standard process for payments. Knowing your stuff projects confidence and experience. Have a clear idea of what you want to achieve through your communication. Which products are you interested in? Do you want to know about pricing, availability, MOQs? Do you want to request samples? Have a clear purpose for your email and focus on that. Don’t overload suppliers with questions. All of your burning questions about extra fees, return policies, shipping etc will be answered in time. Your initial email is just a simple inquiry to get the ball rolling and build rapport. Keep calm. Ask fewer questions. When you first approach a new supplier you want to keep it simple and direct as possible. Your approach will depend on the type of supplier you’re contacting - wholesaler, manufacturer, dropshipper, or liquidator. Simply by asking for “more information”, the supplier will likely answer most of your additional questions in their reply. This avoids you listing a whole bunch of questions that can overwhelm suppliers and result in no reply at all. This script is quite specific, which is fine if you’ve done plenty of prior research. If you haven’t identified the specific products you are interested in you don’t have to list them. My name is [your name] and I am the [your position] of [your business], based in [your country]. I sell [the products you want to stock] online and I'm looking for a new supplier. If you could send more information as well as your product catalog, that would be greatly appreciated. If you’re running a dropshipping business, you’ll need to adapt the script slightly. You don’t need to ask about MOQs and should be more interested in shipping information and ensuring the quality of the products you’re interested in. Asking them to provide “more information” about their dropshipping process will hopefully result in most of your burning questions being answered. My name is [your name] and I am the [your position] of [your business], based in [your country]. I sell [the products you want to stock] online and I am interested in dropshipping some of your products. Can you please include more information about your dropshipping process? I am also interested in getting product samples as soon as possible. You will most likely approach manufacturers if you want to buy direct from the source or you’re interested in starting a private label product. A lot of suppliers are also manufacturers. We’ve kept this example overly simple to show you just how easy it can be to approach suppliers. Thousands of SaleHoo members have successfully used similar templates to this. My name is [your name] and I am the [your position] of [your business], based in [your country]. I found your company on SaleHoo.com and I am interested in selling your products. Can you please send me some information on your return policy, shipping time to the United States and whether you're able to provide product descriptions and images. A lot of eCommerce businesses source their products from China, which means your communication with suppliers likely has to cross a cultural divide and a lange barrier. If you don’t have experience with Chinese culture and don’t speak Mandarin, these tips will help you to communicate with Chinese suppliers more effectively. There are a few cultural differences that you should be aware of when doing business with Chinese suppliers. Guanxi is a Chinese concept defined as “the system of social networks and influential relationships which facilitate business and other dealings”. It’s fundamentally about fostering business relationships. It plays a much more important role in Chinese culture than in the West. It’s harder to cultivate guanxi from afar via email, but it’s something to keep in mind when communicating with Chinese suppliers. Understanding the importance of trust, respect, and mutual benefit in business can help you build better business relationships. Face relates to a person’s reputation or prestige in Chinese society and is also important in business. Again, it’s more applicable to face-to-face interactions, but you can be mindful of this concept in your communication. It’s another reason to treat Chinese suppliers with respect and dignity, especially when you’re dealing with managers or staff further up the hierarchy. It’s been said that “I can’t” is not part of the Chinese vocabulary. This means that they will sometimes say that they can accommodate your requests even if they can’t. It’s important to be aware of this, especially if you notice a supplier seems even slightly unsure about something you’re asking them. There’s a chance they might be saying yes to avoid confrontation. Modern technology makes crossing the language barrier much easier than it used to be. Most Chinese suppliers will be able to translate and reply in English. However, the language barrier can result in communication breakdowns. Here are a few ways to ensure your emails and conversations are understood. Avoid using Western slang, idioms, or complex words. Put the thesaurus down and keep your words as clear and simple as possible. This will make it easier for people at the other end to translate your message. It’s also just a general rule of good writing. Tools like Google Translate are great for simple translations. You can hire translators on websites like Fiverr and Upwork. That way you can have more confidence that your messages are being translated correctly. This is a good option if you’re trying to negotiate more complex business deals. Dealing with suppliers and manufacturers in China poses some risks. Unfortunately, some aspiring online entrepreneurs fall victim to frauds and scams. If prices and terms and conditions seem too good to be true, they probably aren’t true. You can avoid scams and frauds by using trusted supplier directories like SaleHoo. There are plenty more ways to conduct due diligence to be sure you’re dealing with a reliable supplier. Congrats! You’ve successfully contacted a supplier and got a reply. The wheels are in motion. Everything seems above board and you’re ready to place your first order. But first, you want to negotiate a better deal. You shouldn’t accept the first quote from a supplier as there’s almost always room for bargaining. Here are a few tips to help you negotiate with suppliers like a pro. I know you want the best deal, the cheapest price, the fastest shipping, and the highest quality. But the first rule of negotiating like a pro is realising that business deals need to be mutually beneficial. Experienced eCommerce entrepreneurs understand that suppliers need to be getting a fair deal. Attempting to undercut suppliers can be seen as disrespectful and lead to them cutting corners, which can cause issues for you down the line. Creating a win for your supplier can also be a win for you. Remember how I said that suppliers are looking for long-term customers? Positioning yourself as a potential long-term buyer can be a powerful negotiation tactic. One way of doing this is by suggesting a loyalty-based program with the supplier. Another way is simply by saying you’re wanting to establish a long-term partnership with a supplier. The general rule is that the more units you buy, they cheaper they will be. A lot of suppliers will have a MOQ. However, buying the minimum quantity of units often means you’re paying the highest price. When you’re starting out you might not have the capital to buy thousands of units. If that’s you, try this. Ask the supplier how much the per unit cost is for 1000 units. Then ask how much it is for the MOQ. Knowing the price they are willing to drop to can give you extra bargaining power. But remember not to be too tight. Let suppliers know that you’re getting quotes from other suppliers. This can give them FOMO (fear of missing out) and make them more willing to negotiate favourable terms with you. It really depends on how much they want your business. But if you’re projecting yourself as an eCommerce pro, communicating clearly, and negotiating fair terms, they will want your business. You must have a clear idea of how much you’re willing to pay for a product and how much you’re able to sell it for. You want a profit margin of at least 20-40% and ideally upwards of 100%. You have to take into account shipping costs, listing fees, import taxes, packaging, marketing. If you don’t know your numbers, you can’t negotiate effectively. This is a basic template for negotiating on price. The language is purposefully simple and direct, but it ticks all of the negotiation boxes. Thank you for providing the information I asked for. I have received quotes from three other suppliers who can provide [the product you want] at a lower price. Can you provide [the product you want] for [the price you want] per unit if I place an oder for [the number of units you want] units? I am looking for a long-term supplier and I would be happy to work with you if we can negotiate a fair price. Is the deal mutually beneficial (win-win)? Is the price fair for you? Is the price fair for the supplier? Have you projected a long-term buyer mentality? Have you offered to pay upfront (mitigating risk)? Have you contacted multiple suppliers? We’ve created in-depth guides for how to import goods to your country safely and legally. This is the exciting part. You’ve successfully approached suppliers, inspected samples, and negotiated a great deal for your eCommerce product. Once you’ve fulfilled your legal obligations and set up a contract with your suppliers, it’s time to place the order. This is the easy part. Then you just sit back and wait for your first shipment, or if you’re dropshipping - your first sale. As you can see, approaching suppliers is all about communication. It doesn’t have to be fancy or complex. In fact, it’s much better to keep it simple, especially when dealing with suppliers in China or other non-English speaking countries. Even if you’re a newbie trying to negotiate your first business deal, approaching suppliers can be a breeze if you can communicate like a pro and project yourself as an experienced seller. Always remember that you’re dealing with another person who’s trying to run a business just like you. Treat people with respect and you’re more likely to get respect in return.